Description: The city of Amritsar, in the Punjab region in northwest India, began producing carpets in the 19th Century when Kashmir was annexed by Maharaja Ranjit Singh. Kashmir was a major weaving center of shawls at the time. The looms established here by both British and American firms utilized the availability of good quality wool from sheep that grazed in the nearby mountains. The designs were primarily inspired by classical Persian, Turkish, and Mughal carpets from the 16th and 17th Centuries. 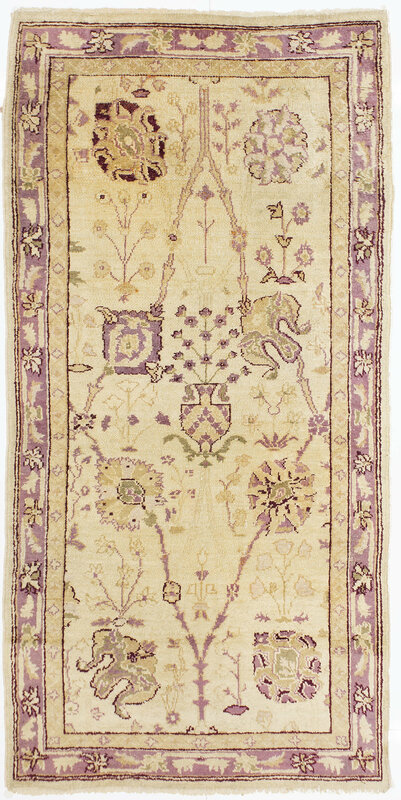 One large sub-group of these carpets, known as Indo-Isfahans, emulated the patterns of Isfahan court carpets by having their overall arrangement of large-scale palmettes interspersed with cloud-band motifs, often executed in softer color palettes than their counterparts.